In October 2015, Thailand submitted a letter to the UNFCCCC specifing its INDC. The letter stated, “At COP20 in Lima, Thailand pledged our pre-2020 contribution of 7-20% GHG emission reduction by 2020 below business-as-usual (BAU) in the energy and transport sectors.” Its INDC in 2015 still adheres to this very limited pledge of a 7% target as a voluntary domestic effort. According to the government, the extra 13% would only occur if Thailand received international assistance. The letter also states that “Thailand has already achieved 4% of GHG emission reduction from the projected 2020 BAU and is well on track to achieving the 7% target pledged as voluntary domestic efforts by 2020.” However, this claim is questionable especially because the military government, which seized power in 2014, is promoting the usage of coal. In the latest national Power Development Plan (PDP) 2015-2036, the government plans to increase the country’s coal usage from 15% to 20-25%. It seeks to build 9 more coal power plans and 20 natural gas plants. Further, current Prime Minister Prayut Chan-o-cha has declared that renewable energy is expensive and insufficient to deal with rising electricity demand. It seems therefore that the government plans to increase carbon emissions for the foreseeable future. The INDC disappointingly does not state why a 7% target has been chosen, never mentioning an atmospheric GHG level target. This number seems very low especially given that at least 40-70% cuts are needed globally by 2050 to give the planet a good chance of staying below 2 degrees. The letter never mentions the words “justice” and “equity” and clearly it does not seem that these notions were taken into account when the Thai government decided upon its unambitious target of 7%. There is no indication in this letter that the nation considered its ethical obligations to those who are most vulnerable to climate change. The letter states Thailand’s average emissions is below the global average: “in 2012, per capita GHG emissions is at 5.63 tCO2e and emissions per GDP (US$ million) is 409.54 tCO2e, which is lower than world average.” However, it fails to mention that Bangkok, the country’s capital, ranks as one of the highest-emitting cities in the world per capita. A World Bank study revealed that in 2005 Bangkok emitted 43 million tonnes of CO2 (and 7.1 tonnes per capita), only one million ton less than London’s total (which emits 5.9 tonnes per capita). 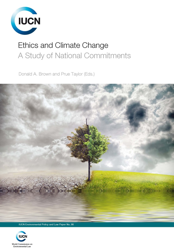 NGOs, journalists, and academics have not had any significant opportunities to participate in climate change policy formulation at the national levels. It seems that after the military coup NGOs have limited power to advocate for this change. The military government has given NGOs very little space for advocacy. NGOs, journalists and academics have spoken out against the national INDC and the government’s plan to expand fossil fuel production and usage. For example, the Thai journalist Wasant Techawongtham wrote in the Bangkok Post in August 2015, “The promotion of coal-fired power plants is unconscionable and morally repugnant, especially when better and viable alternatives exist”(Techawongtham 2015). In another article in the same newspaper, Suphakit Nantavorakarn, an economic and renewable energy advocate from the NGO Healthy Public Policy Foundation, declared that the government needs to transform its energy policy if it wants to achieve its INDC and that the government could be more ambitious in terms of its emission reduction target. He stated, “Indeed, Thailand can do much better than a 7% emission cut if the government gets serious about promoting and developing renewables. There is a lot of potential for the country to generate electricity from farm waste, garbage landfill and energy saving projects. Solar energy is becoming more affordable. The world trend towards renewable energy is clear, yet Thailand still sticks to an archaic myth of energy security” (Kongrut 2015). The recent letter the government sent to the UNFCCC hints at why Thailand lacks aggressiveness in terms of its INDC. The letter states, “Energy security has long been an issue of concern over the course of Thailand’s development.” It seems therefore that energy security, which the government links to its national economic interests, is an overriding concern for Thailand and more important than its ethical obligation to cut emissions. As mentioned above, the military government has given NGOs, citizens, and other interest organizations very little space for advocacy. Nonetheless, some local communities have protested against the government’s plans to expand coal production. In July 2015, over 100 residents from Krabi province protested for fourteen days outside of the Government House in Bangkok against the government’s plan to build a coal-power power in this province. In response, Prime Minister Gen Prayut Chan-o-cha has ordered the project to be suspended until a joint committee can ensure that all steps of the pre-construction process have been carried out legally (Plerin 2015). Please see my response to this question last year. Kongrut, Anchalee. 2015. “Bringing Climate Change Policy into the 21st Century.” Bangkok Post, August 7. http://www.bangkokpost.com/archive/bringing-climate-change-policy-into-the-21st-century/647888. Phuket Gazette, July 24. http://www.phuketgazette.net/phuket-news/PM-Prayut-pauses-hotlydebated-Krabi-power-plant/61564#ad-image-0. Techawongtham, Wasant. 2015. “Wake up: There Is No Future for Coal.” Bangkok Post, August 14. http://www.bangkokpost.com/lite/topstories/655248/wake-up-there-is-no-future-for-coal.